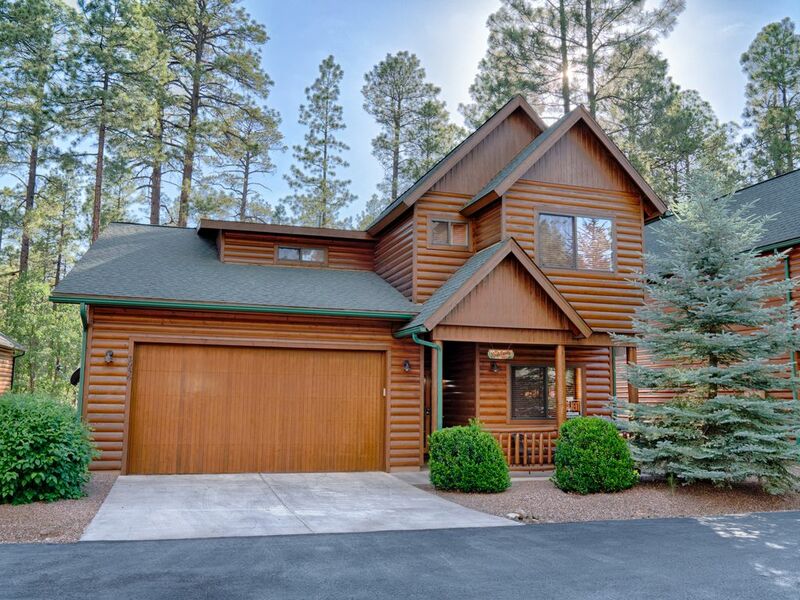 Beautiful 5-Star Premier listing home in gated community of Pinetop Crossings! Hello and welcome to THE KNAB FAMILY CABIN...your home away from home in the beautiful White Mountains of Pinetop, Arizona! Read our 80+ 5-star reviews to see why guests love staying at our home! We are now accepting pets WITH owner pre-approval and required pet fee. Please message us to discuss bringing pets BEFORE you book. More details regarding pets below. Our home features plenty of space for 1-3 families including beds for up to 12 guests (8 guests Maximum. (2300 SF). We take great pride in providing our guests with beautifully decorated home that is appointed with everything you will need for a wonderful stay! We are located in the beautiful gated community of 'Pinetop Crossings', which is ideally located in the heart of the White Mountains...adjacent to Pinetop Lakes Country Club and close to Sunrise Ski Resort, fishing, bike & ATV trails, parks, movie theaters, golf, shopping & restaurants! Our home features a comfortable & cozy living room with beautiful furniture, a floor-to-ceiling stoned fireplace, pine vaulted ceiling, and a hi-def flat-screen T.V. You'll love hanging out here with your guests! We have 2 bedrooms downstairs and 2 bedrooms upstairs, as well as a kid's bunk room that sleeps 4 kids. We sleep 12 people in beds (8 adults maximum allowed because the 4 beds in the kid's bunk room are designed for kids only). There are 3 FULL bathrooms as well! Upstairs there is a loft with a large sectional and TV where kids love to hang out! Our family of five loves coming to Pinetop! Our home is cozy enough to enjoy by ourselves...and large enough to enjoy with several additional families. Either way, its the perfect place to both relax & have fun! We invite you to come make your own wonderful memories...we know you will have a great time and look forward to having your as our guests! Non-US Residents - $500 Refundable Security Deposit AND $59 non-refundable Renters insurance. For longer stays, please contact us to discuss cost. For the safety of our guests and our home, there are 3 security cameras located outside the home. The are located at the front door, back door, and inside the garage) There are NO security cameras or other recording devices located inside the home. International Guests: Please note International credit card fees charged to the homeowner when renter uses an International Credit Card are the responsibility of the renter and must be reimbursed to homeowner. Thank you. Our family loves to come to Pinetop to get away from our busy day to day lives and spend wonderful, quality time together as a family. The weather in the White Mountains is beautiful during every season! You can stay as busy as you like....or just kick back and relax! We chose a home in the community of 'Pinetop Crossings' because of its great proximity to everything in the White Mountain area. It is lovely gated community that is beautifully maintained by the HOA. Our home has a great floorplan that is cozy enough for a single family to enjoy, yet big enough to accommodate 2-3 families! With 4 bedrooms, a bunk-bed room (sleeps 4 kids), 3 full baths, living room, upstairs loft and 3 TV's, there is plenty of space for everyone to spread out! Or, if you prefer, everyone can hang out together in front of the fireplace in the living room where you can watch TV, play games or just talk and enjoy each other's company! Wood burning with Gas start-up. Renters provide their own firewood to burn. Dining Table seats 6. 2 Barstools at Kitchen counter. Patio table seats 6. We also have a card table that can be added to the end of the dining table w/ 3 folding chairs increases seating to 9. Large 48" flat-screen in living/Family room with Basic DirecTV & DVD player. 36" Flat Screen TV in loft with Basic DirecTV. 32" Flat Screen TV in Master Bedroom. Easy drive to Sunrise Ski Mountain! Tennis court rentals available just down the road at Pinetop Lakes Country Club. Our community (Pinetop Crossings) is adjacent to Pinetop Lakes Country Club...a top-ranked Executive course. There are additional country clubs in the area. For the safety of the home and our guests, there are 3 security cameras located outside the home. The are located outside the front door, outside the back door, and inside the garage. There are NO security cameras or other recording devices located inside the home. Great layout and very spacious! Garage access was an added bonus. Beautiful cabin for our winter get away. Awesome snow experience for the kiddos and exceptional guest service by the homeowner. We will be back.. Absolutely loved staying in the Knab family cabin!! From my first interaction with Lisa, I knew she cared about our family experience. The cabin is clean and beautiful, stocked with anything you might need or forget on your trip. From games, the snow man kit in the garage to wine charms in the kitchen, she has everything!! We definitely appreciated it all & look forward to booking again in the near future!! I Highly recommend for other families as well!! Beautiful Cabin/House. Well kept, The Knab Family Cabin is fantastic. Lots of space, lots of beds, lots of rooms, 3 full bathrooms, two family rooms. Just great. Easy to find. We had 4 Adults and 5 children ages 5 to 10 and we all had a blast. Great manual in the house with amazing detailed instructions for EVERYTHING. Also had several pamphlets of places to eat and places to visit around town. Overall a great vacation. Thank you to the Knab Family! Comfortable home and responsive ownership! My family and I had a wonderful stay at the Knab Family Cabin. The home was well-maintained and comfortable, and the roomy kitchen made it easy for three and even four people to move throughout the space as we prepared meals. We loved sitting on the back patio with a cup of coffee in the morning and a cocktail in the evening. The homeowner, Lisa, was very responsive, and it was apparent throughout the entire process that she cared about the quality of our stay. Located 20 miles from Sunrise Ski Resort, which is as close as you can stay unless you stay on the Indian Reservation. Easy, straight drive on one direct road! Located 3 miles from Hon-Dah Resort & Casino...30 miles from Greer. Private, quiet gated community...safe for kids to play outside, go for walks, ride bikes. Local parks, lakes, shopping, movies, and lots of fun things for kids to do throughout Pinetop and the surrounding areas!